Discover Chiropractic is a comfortable place with a friendly team that ensures your visits are productive and relaxing. We’ll keep your best interest in mind at all times, which is why we take an individual approach to the new patient process. Whenever possible, you’ll receive an evaluation, report of findings and treatment right away on your initial visit so that you can get quick relief. Occasionally, it may be appropriate to first determine your needs, then give a report of findings on the second visit. Please rest assured that this process will be tailored to your needs and what is best for your particular situation. Depending on your case, we may begin your care immediately to get you relief. Please plan on spending about an hour with us for this visit. If we believe you’ll benefit from another specialist, we’ll provide you with a trusted referral. All of your questions will be answered, and we’ll make sure you know exactly what to expect from care. Normal visits usually last around 10 – 15 minutes and include a quick check-in, meeting your chiropractor, catching up on your health, all necessary adjustments, and any at home recommendations. We’ll schedule your next appointment and let you get back to your day! We’ll always monitor your progress and of course, adjust your care plan when necessary. For true wellness, we believe it’s important to maintain good spinal health, eat well, exercise regularly, relieve stress in a healthy way and take high-quality supplements. We’ll provide our recommendations for your healing, discuss what it will take to fix the problem and how to keep it from coming back. How long you benefit from chiropractic care is always up to you. If you choose to visit us for maintenance care, we’ll happily welcome you with a wellness care plan. We hold in-house health and wellness workshops twice a month. New patients are welcome to attend these talks that will address how to get out of pain as fast as possible and how to stay that way. We want you to expect a great experience when you come in for your appointment. 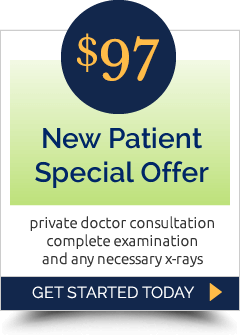 Get the immediate attention you need – contact us to schedule a same-day visit! We look forward to meeting you and helping you live a life of complete health and vitality.